I recently announced I would not be blogging for a few weeks as I focus on technical matters with the upcoming launch of my new travel and humor website, globejotting.com. Unfortunately, a bizarre and ugly situation has arisen involving Jon Flatland, a veteran newspaper editor in Blooming Prairie, Minnesota. Last week, I discovered Mr. Flatland has been routinely and systematically plagiarizing my writing and that of many other humor columnists for many years — at times on a regular, weekly basis. As this event is gaining media attention in the United States and reporters are contacting me for details, I feel a need to issue a statement outlining how I stumbled upon Flatland’s activities. 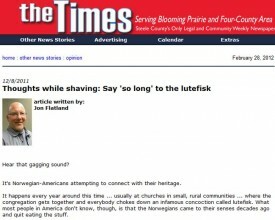 Two weeks ago, purely by accident, I discovered Flatland had plagiarized one of my humor columns in multiple newspapers. Flatland changed minor details to make it sound as if he had written the story himself. He then put his byline on it and, on multiple occasions, took credit for writing it. I found Flatland’s columns while preparing to move content from my current websites to the one I am about to launch. 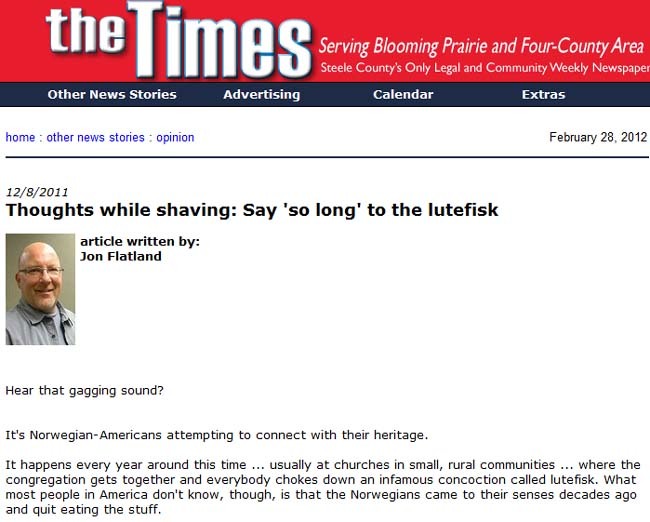 In Googling several of my stories to see where they ranked on search engines, I discovered a humor column I had written in 2001 had been published under Flatland’s byline in 2005 in the Steele County Press and the Benson County Farmers Press in North Dakota. As the story was on the Farmers Press website, I e-mailed that newspaper and asked them to investigate. The Farmers Press did not reply to my initial e-mail. At this point, I sensed there was something bigger than the simple plagiarism of one story. I began Googling random phrases in Flatland’s other columns. For almost all of Flatland’s humor columns, I quickly found nearly identical articles by other writers. I contacted all of the writers I could locate and asked if their work had been plagiarized. Every one of them confirmed this was the case. I e-mailed Rick Bussler, publisher at the Times, and sent a second e-mail to the Farmers Press. A few hours later, Bussler phoned me at my home in Singapore. Bussler told me Flatland had left the Times office as soon as he caught wind of what was unfolding, and e-mailed his resignation to Bussler an hour later. In our 40-minute conversation, Bussler asked me to extend his apologies to all writers involved. In this week’s edition of the Times, Bussler apologized to his readers and the plagiarized writers, and underscored that he had known nothing of Flatland’s unethical behavior before I contacted the paper. Peterson has since removed Flatland’s plagiarized material from the Farmers Press website. I am urging him to follow through with his additional ethical duty as an editor, and publish a full disclosure of Flatland’s activities. Charles Memminger, a former columnist for the Honolulu Star-Bulletin, is also among those who Flatland plagiarized. Memminger has been in touch with the Steele County (North Dakota) Press, a newspaper Flatland owned at one time. Memminger tells me the Press is also conducting an investigation. The Ashley Tribune, also in North Dakota, have stepped forward to inform me Flatland worked at their newspaper as well from 1989 to 1994, and that they will report the story in their next edition. The reporter who interviewed me told me Flatland had reportedly been fired from another job for plagiarism earlier in his career. Flatland was a reporter, columnist, and editor at numerous Midwest newspapers for 28 years. He also served as president of the North Dakota Newspaper Association for one year and had served on the board of the Minnesota Newspaper Foundation, according to Bussler. In 2011, Flatland accepted an award from the NDNA for a humor column that was in fact written by Jason Offutt, a writer in Missouri. The NDNA has been helpful in investigating Flatland’s activities. It is troubling when a rookie reporter plagiarizes the work of others. For a 28-year newspaper veteran to do so as habitually and brazenly as Flatland did is unfathomable. For nearly three decades, he has masqueraded as a legitimate writer when in fact, he has been a journalistic parasite, feeding off the hard work of others. Flatland has earned money for work that I and roughly a dozen other writers (who we know of so far) have done. He has further hurt us financially by creating a situation that compels us to follow journalism ethics and devote time to this issue when we have other work to do. He has lied to the editors and publishers who hired and trusted him, and lied to every one of his readers. He has left me and many others feeling violated and emotionally unsettled. While we who have been plagiarized are humor writers, we treat copyright and intellectual property issues with profound seriousness. We have devoted many years to honing our skills and literary voices. For Flatland to cheapen our years of hard work by stealing our words is just as vicious, if not more so, as breaking into our homes and stealing our physical property. In situations like this, it is common for people to chuckle about “imitation being the best form of flattery.” But what Flatland has done is not flattery. It is criminal. It violates one of the most sacred and basic principles of American journalism. Writers who respect the values of a free press have a responsibility to confront and expose unethical behavior in their profession. If we do not do this, we enable a press dominated by fraud and dishonesty. My motivation in speaking out against Flatland is not to shame a man I have never met. My motivation is to protect writers, editors, and readers who would be hurt if he were allowed to continue with his lies. I am grateful to the newspapers and organizations where Flatland worked that are addressing this situation thoroughly. For an editor to have to disclose such information about an employee or former employee is painful. Flatland has put many people in terribly awkward positions. Nevertheless, dealing with such matters is a basic responsibility of any publisher. I urge publications that unwittingly ran Flatlands plagiarized columns to immediately publish a full disclosure if they have not already done so. To my usual readers, I thank you for your understanding as I have deviated from my usual, lighthearted tone. Once my new website launches in a few weeks, my hope is to turn this situation into a teaching opportunity in which I can help people protect themselves from online plagiarism. Several US media organizations have asked me to comment on this case. While I currently live in Singapore, I am available for phone interviews, and to discuss these events with affected writers and organizations. You can reach me by e-mail at [email protected]. Please include your phone number, time zone, and the hours you are available to receive calls. 2014 Update: In spite of the fact that Flatland’s rampant plagiarism received widespread, national coverage in the American media, Richard Peterson and the Farmers Press never published an apology or an acknowledgement of Flatland’s actions. I consider this to journalistically unprofessional and unethical on the part of the Farmers Press. While I believe the Farmers Press editors were not aware of Flatland’s widespread plagiarism at the time he was doing it, their refusal to publicly acknowledge it once they became aware makes them complicit in his behaviors. He loves your stuff so much he copied it verbatim. He took it for free. You complained. Therefore, you don’t believe in free love. I’m glad you caught the guy. What a terrible person. Thanks for your hard work on this, Dave. Ethical journalists everywhere salute you! If I was in Singapore I’d gladly take you to dinner for this one. Dave, EXCELLENT job digging this out. I really enjoyed your tweets at @GlobeJotter because you lay out your discoveries and emotions in real time. Fascinating to read. I’m proud to know you, and proud of the way you handled this. Good luck on your new website debut later this month, http://www.globejotting.com. My jaw totally dropped when I read this. What the guy did was really messed up, but I kind of can’t believe he just up and quit when he was caught. I work with him now. He is has not changed, I feel bad for him. He is a fake person and does not know how to be himself.